Bob Lizik's career continues to be marked by stellar accomplishments and performances. He has performed on thousands of television and radio commercials; and those ads have sold the food and beverages you consumed, the cars you drove and the places you shopped. He has recorded with Barbra Streisand, Billy Joel, Joe Sample, Eric Clapton, Mavis Staples, Madonna, Mariah Carey, Dennis DeYoung and Kylie Minogue. His longest association has been with the iconic songwriter, musician and founding member of the Beach Boys, Brian Wilson. Wilson will be touring this summer and it is a show any lover of music should not miss. Mr. Wilson's music is as the saying goes, timeless. Hearing songs from the catalog of the Beach Boys still resonates some 50 years after they were recorded. God Only Knows, Wouldn't It Be Nice, Good Vibrations are a few of the classic songs recorded by the Beach Boys. Wilson's music compositions are among the most consequential of the rock era; and he is highly regarded in the pantheon of giants of the second half of 20th century music. 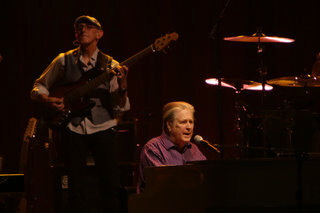 He will be touring this spring and summer and you can find those tour dates at Brian's website, brianwilson.com. I love music. I have always loved music. My parents graced me with the presence of music in our home from the beginning of my life. Frank Sinatra, the big band orchestras and their various singers were a huge part of my growing up years. My older siblings introduced the Beatles and the ever growing list of not just the then British invasion, but also many of the significant American acts that were formed and groomed during my childhood. How could I not love the boys of summer? I had a wild moment when I first moved to Los Angeles some 30 years ago. I was going to be staying with a friend's mother-in-law. She is now deceased, but one day early on in my arrival she casually mentioned a good friend of hers. That woman was the mother of Brian, Dennis and Carl Wilson. It was one of my first "celebrity" experiences and of course, I was thrilled. Her home was planted less than a mile from where Dennis had once gone surfing. In honor and support of Brian Wilson's upcoming tour, I had the privilege of interviewing the gifted musician who has been with Brian's band for some 20 years. He is the bass player for Brian Wilson and he has had his own illustrious career supporting some of the biggest names in music. Bob Lizik has been a professional musician his entire adult life and he still maintains his Chicago roots with his family in the suburbs of Chicago. He spent many years as one of the most sought after musicians for the huge jingles market this city was involved in with the advertising community. Judith: Bob, you've had a long association with Brian Wilson. Wilson, of course has been beloved by the critics and his fellow songwriters/musicians for more than a half century. He is also a member of the Rock and Roll Hall of Fame. How did you land the bass player role in his band that has now been a part of your life for the last 20 years? Bob Lizik: I worked a lot with a producer named Joe Thomas, and he was doing the Imagination album with Brian. Joe asked if I wanted to play on a couple of tracks, and of course I was thrilled. When the album was finished, Joe thought Brian should do a little tour to support the album. At first it was just a couple of weeks, then they added another week, and here we are almost 20 years later. Some of Joe's credits are: The Beach Boys - Stars and Stripes, Volume 1, Brian Wilson - Imagination, Dave Matthews Band - Weekend on the Rocks and Stevie Nicks -The Soundstage Sessions. Judith: I had the good fortune of meeting the surviving Beach Boys back in 2006 with a Capitol Records rooftop celebration for their Pet Sounds album 50th anniversary. It would be an understatement to say it's a superb album. I'm particularly fond of Wouldn't It Be Nice and God Only Knows. What are your favorite Beach Boys songs? Bob Lizik: There are so many, and it changes depending on my mood. Warmth Of The Sun has always been a favorite, along with Wouldn’t It Be Nice, Wind Chimes and Surfs Up from SMiLE, and I always loved Don’t Worry Baby. Judith: Hearing your choices, makes me want to play their music right now! Can you share what the rehearsal and road touring life is like with this current line-up of Brian Wilson's band? Bob Lizik: We don’t rehearse much. There’s usually a day or two before a tour, and that’s mainly to get the dust off and maybe add a couple of songs. Everyone takes it seriously, and knows their parts. That being said, we’re constantly tweaking parts at soundcheck. The guys are always revisiting vocals and making sure the parts and phrasing are correct. We have a great crew that takes care of us. They don’t get noticed, but they move us, set up, do sound and lights and all the technical stuff involved with doing a show. Touring is pretty smooth. We fly out to the first gig, then we have several tour buses. The bus becomes home, even though we get rooms every night, the bus is home. After shows, we might get on the bus for a drive. You can either hop in your bunk, or stay up and watch a movie, have a drink or something to eat, or just hang. On the last tour in Europe, we watched every season of Game of Thrones. On off days, some of the guys play tennis or go to movies or just chill. Judith: Bob, you started your career in Chicago. I know you had a long-running and successful career as a jingles/ads musician. What are a few of the jingles you recorded? Any iconic brands or campaigns? Bob Lizik: I played on just about every product out there at one time or another. McDonald's, Pizza Hut, Ford, Chevy, Sears and so many more. Chicago was a big advertising town. I think some of the big ones were the Bud Light Bring Out Your Best campaign, Mazda Zoom Zoom, and Busch Beer Head For the Mountains campaign. Judith: Bob, I understand you had a love for the big bands. I love the big bands. I play that music quite often. What are your favorite songs from that era? Any favorite musicians from that time? Bob Lizik: My dad had old Glenn Miller, Harry James and Dorsey Brothers albums, so songs like A String of Pearls and Sing Sing Sing were favorites. When I got a little older, my teacher, Harry Grebb turned me on to Stan Kenton and Woody Herman. Judith: I have a fondness for Woody Herman's Woodchopper's Ball. It's feel good music! You are from the Bridgeport area in Chicago. Bridgeport is the oldest neighborhood in the city of Chicago and is still a lively and prospering area of the city. Any favorite memories from your youth? Bob Lizik: I have lots of memories. Turning on the fire hydrants in the summer and playing in the water. Playing fast pitch against the wall at Immaculate Conception parking lot and being chased out by the priest. It was a great neighborhood. A lot of kids. We’d play all day and night. Judith: Who were the most influential musicians in your life? Favorite bass players? Bob Lizik: The most influential was my music teacher Harry Grebb. He’s the reason I wanted to be a musician. He owned a small music studio and gave lessons on everything. I started on accordion with him, and switched to bass. He was a great guy. There are a lot of bass players I love. Obviously Jameson and Jaco, but there’s Gary Willis, Marcus Miller and Anthony Jackson. One of my favorites is Lee Sklar. Judith: Which musicians/songwriters of today are people you would say will have long-running careers? Bob Lizik: I think Jacob Collier is absolutely brilliant. I’m amazed by his talent. You have to check him out. I also like Bruno Mars. I think he’ll be around for a while. Judith: How do you manage life with a wife, children and grandchildren with so much time on the road? Bob Lizik: It was hard when my sons were little and I was gone. I missed them so much, but it was the career I chose, and I had to make a living. Luckily I have a great wife that understands, and supports what I do. Now I miss my grandkids when we’re out. I try and make up for being gone when I get home. Judith: You've worked with some giants in the music industry (see above). In my younger years I was never a fan of Barbra Streisand's, but about ten years ago I was in the car listening to her interpretation of the Leonard Bernstein/Stephen Sondheim song Somewhere from West Side Story. I was listening. Really listening. Those few moments (even though I had heard the song several times before) changed the way I felt about her instantly. I love her voice. When did you work with Barbra Streisand? What was the experience like? Bob Lizik: The Barbra Streisand session was amazing (Bob worked on the Streisand album Emotion in 1985). We recorded in Capitol Studio A in Los Angeles with a full orchestra. We ran the songs a few times, and then Streisand came in and sang live with us. It was really special hearing that voice in my headphones while I was playing. Judith: What's the smartest move you ever made in the music industry? What's the dumbest thing you ever did musically? Bob Lizik: Probably the smartest move was taking the Brian Wilson gig. It came at a time when the jingle business was tanking, and it’s been a great experience. I think the dumbest was not moving to Los Angeles when I was younger. I had a couple of opportunities in the 70’s to go, and I stayed in Chicago. I sometimes wonder how that would have turned out. Judith: Everyone has go-to artists. Who is your go to artist? Favorite singers, both male and female? Bob Lizik: Stevie Wonder is my go to. Favorite singers would be Stevie Wonder, Eric Benét, Corinne Bailey Rae and Jill Scott. Judith: I always want to know from people... if you are stuck on the proverbially stranded island which five albums will you want in your possession on that island? Bob Lizik: Songs In The Key Of Life by Stevie Wonder, Talking Book by Stevie Wonder, Plantation Lullabies by Meshell Ndegeocello, Pet Sounds by The Beach Boys and West Side Story from Oscar Peterson. You can catch Bob Lizik playing Bass on the 2018 Brian Wilson tour. For tour dates, check out www.brianwilson.com. Thanks to Bob Lizik for taking the time to share a bit about his career. Now go and listen to Wouldn't It Be Nice and I promise you will feel good! 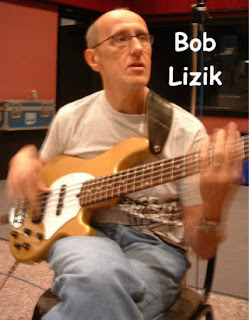 An excellent clip of Bob Lizik on bass with a performance of the classic love song, God Only Knows. Black Hills of South Dakota - A Must See Visit! One of the Best Vacation Destinations in the U.S.A. Yes, you can do the Black Hills of Dakota and the surrounding attractions in a long weekend out of Chicago. Fly to Rapid City, South Dakota via a short stopover in Minneapolis and you will find yourself in one of the most beautiful and downright of American places. The Black Hills of South Dakota offer a variety of things to do and you can do them all in a long weekend. I left Chicago on a Thursday morning and arrived in Rapid City, South Dakota with a short one hour shuttle trip to Deadwood, South Dakota. 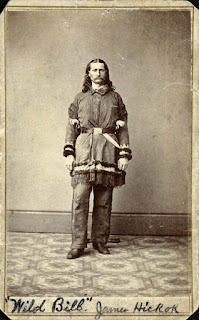 Deadwood became famous in the 19th century for a series of homegrown and recruited gunslingers. It was a down and dirty town in the Old West and it attracted the likes of one-time lawman, Wild Bill Hickock. Hickock was only 39 years old at the time of his death, but he has been immortalized by American western folklore. He was killed at the #10 saloon by Jack McCall and there is a staging of the shooting in the town of Deadwood. (Spoiler and the one bad thing about Deadwood is coming up in the next couple of sentences) The town of Deadwood today encompasses about one mile of shops, hotels, restaurants and just about all of them are in possession of slot machines. This was a major turnoff. It's overkill and that's an understatement. Everywhere (almost everywhere) you go, you are inundated by slot machines. The tourist town you wanted to visit has become a slot machine zone. Once you zone out of that scene you can attempt to enjoy the town. The Springhill Marriott which is about two blocks away form the start of the Deadwood city heart is a lovely property that is quite top of the line. The property is clean and it offers a nicely outfitted workout center and an excellent breakfast. Again, it's clean and I mean clean. There is a tour of Deadwood that you can take and it takes you around town and up to Mount Moriah Cemetery. The cemetery has the graves of Wild Bill Hickock and his fellow gunslinger, Calamity Jane. If you know much about old Hollywood movies you will note that Calamity Jane looked nothing like Doris Day who portrayed Calamity in the 1953 version of her life (Hollywoodized 1950's version of her life). 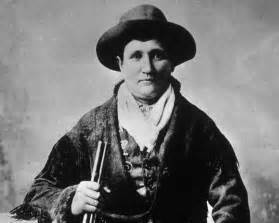 Keep in mind, this would be loosely based and I do mean loosely based on the real life details of Calamity Jane and Wild Bill Hickock. The second day is a full day in the area. 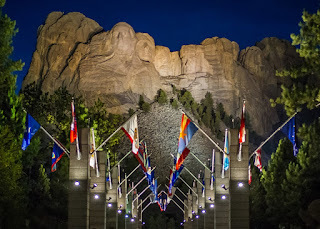 Mount Rushmore is a monumental and majestic site and it is easily one of the must see, bucket list items on any travellers list of things to do and places to encounter. If it isn't on your list it should be. 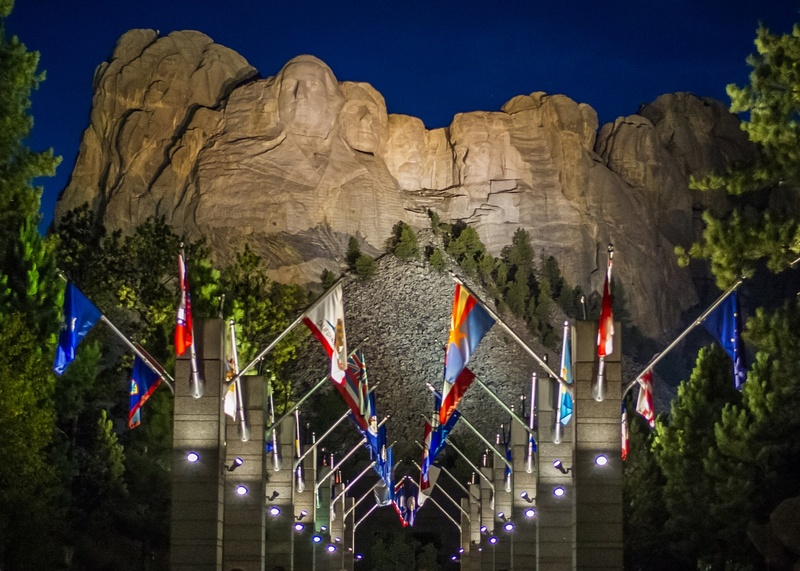 Mount Rushmore is a spectacular location and must be viewed during the daylight and during the darkened part of the day, so plan your day around seeing this mighty site both times during the day. You will find yourself taking photos in various locations around the National Park. Walk the Presidential Trail around the famed mountain and you will even get in a bit of your daily exercise. A short film on the creation is part of the offerings at the National Park, along with a superb gift shop (well, that's a given). Veterans will appreciate a tribute to their service to the nation. The United States has been and still remains one of the most significant nations in the history of the world. It's history is varied and its charms are plentiful. 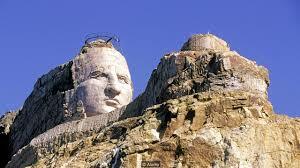 Go to the unfinished monument dedicated to Crazy Horse and you will note this - it will forever remain unfinished. If they haven't found the funds to pay for this yet - clearly, they never will. 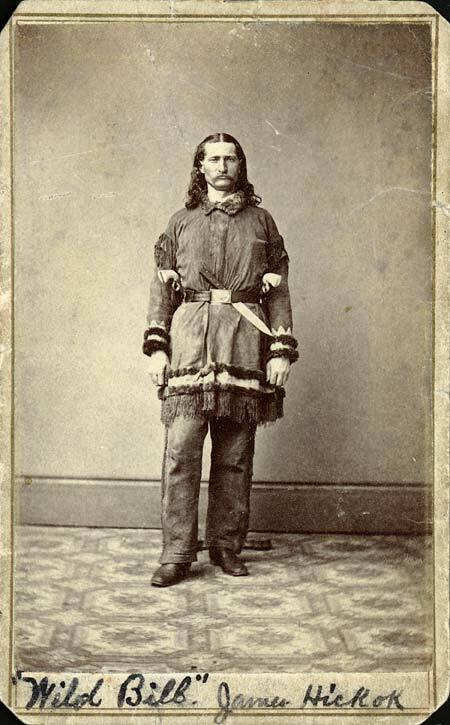 Crazy Horse was a famed member of the Sioux tribe and he became near immortal during the Little Big Horn battle with the United States Army led by General George Armstrong Custer. Since Crazy Horse would never allow himself to be photographed one could argue this memorial goes against his very core. Having said that, many love this unfinished tribute to the man who hailed from this part of South Dakota. Custer State Park is a spectacular opportunity to see the beauty of the topography of this part of South Dakota. A wide variety of wildlife sightings await your journey. You can see Pronghorn, White Tail Deer, Bison, Wild Turkeys, Wild Burros, Elk and a slew of Prairie Dogs. Driving through the Black Hills will prove to be a fruitful decision to visit the area. The Badlands are stunning, but this is a full day of scenic driving. You can do everything on a tour or not, so go with what makes you comfortable and safe. It is hard to believe the Badlands sit next to the Black Hills. God is certainly creative! For me, music is the most satisfying, sentimental, heart-tugging, time reversing, pleasurable (and I could keep going) of all of the arts. There are deep emotional attachments with music, particularly music one came of age to. Music isn't like a film or a television series. As much as I love filmed entertainment there is rarely a time I go back again and again, but can anyone actually know the number of times you have listened to a song that was released when you were ten years old, fifteen years old, twenty years old? Yet, we still listen and enjoy over and over and over again. I read recently the music that embeds itself into your life the most are the songs that were released between the ages of ten through 22. I would agree with that assessment. As I look back on my life, which I do with some regularity, that is the 12 year period of music that resonates most with my heart and soul. With that, I was thrilled to encounter a Chicago based cover band that produces heartfelt and passionate interpretations of music from the 1970's. Thanks to guitarist/keyboardist/vocalist, Jeff Sismelich for taking the time to answer a few questions about the music. Before I get to the interview I wanted to note a recent encounter with a young guy who couldn't have been more than 18 years old. We were both waiting to give a song request at an event. He was thoughtful and offered me the first go, but I said "no, you go first." He then looked at the keeper of the music for the night and stated "anything by Journey." I wasn't going to request Journey at that moment, but my heart was so settled by the young guy loving Journey I just looked at them both and said "ditto." I walked away knowing the world is not what it once was, but for this one brief moment in time, it felt just right. Don't Stop Believing. Judith: Jeff, I've seen Strung Out a couple of times and you guys are good! I love the sound and the respect you pay to the original arrangements and yet you make a few creative tweaks along the way. You are all impressive musicians. How did the band get its start? Jeff: We formed Strung Out in January, 2012. I was playing in The Blooze Brothers (Chicago’s premiere Blues Bros Tribute) as the Jake character with our cello player, Tom Culver, who founded the band in the 1990's. Jeff James our drummer was also in that band. Tom was interested in putting something together so that he could play more cello. He’s been classically trained since he was a child, and teaches junior high orchestra. We are in large part unique in that we have an electric cello as part of the band. So after trying different iterations (acoustic, trio, quartet, etc. ), our drummer Jeff introduced us to Ted Spaniak, who he had played with in a couple of different bands. Ted is a really talented guitarist and piano player. Once he was on board, we decided an electric classic rock band seemed to make sense, so I contacted John Chisari, a bass player I knew. John was last the piece we needed, and Strung Out was born. We booked a few shows really quickly and were off and running. Now I book most of our shows, but we all pitch in with our various contacts and opportunities. We've been fortunate. We plays clubs, festivals and corporate events. Judith: Are you all still working beyond the band? If so, how does this alter and affect your schedule? Jeff: We all have real jobs. This group is really great about making and keeping commitments to the band. We rehearse fairly regularly to add new material, and play primarily on Friday and Saturday nights as often as we can. During the summer, we play more weeknight shows, like fests and concerts in the park. Tom is Director of Orchestras at School District 102 in LaGrange Park. Ted teaches English at Rich East High School in Park Forest. Jeff is a Lab Manager for TestAmerica Labs in University Park. John is a salesman for RiteRug Flooring in the Chicagoland Area. After over 20 years in the television editing business, I now own and manage my family business, Papoose Children’s Center in Oak Lawn. The Center has been around for 55 years. Judith: Strung Out plays a variety of different music styles from the 1970's and a little bit of the 1960's. Was this just love of the music from your generation or was there more behind the decision of what to cover? Jeff: It was mostly our love of that era. It’s the music we all “grew up” on. We all appreciated the diversity you’d hear on the AM radio when we were young, but we also recognized that there was a musical void out there among working cover bands. There are a ton of 80’s/90’s bands who are great. There are several great 50’s/60’s acts, too, but we never heard bands covering the 70’s with the diversity that we wanted to present. It’s the memories that are attached to the songs that people really relate to. Judith: You can repeat that. Yes, the memories are deeply held emotional attachments. You play everything from iconic One Hit Wonder songs (Dancing in the Moonlight, Magic, Brandy -You're A Fine Girl) to songs by some of the definitive acts of the era. How do you come up with your playlist? Jeff: We argue a lot. LOL. It’s really difficult sometimes to come to a consensus. There is so much material in the decade we all love. That’s why we come up with the medleys we play. How do you pick only one Three Dog Night song? We couldn’t, so we put five of them together. I’m a big fan of the one hit, kinda cheesy stuff. Other guys like the more epic rockers like Led Zeppelin, Deep Purple, & The Who. We get it all in our sets and we strive to add the most fun and interesting material we can. Judith: The musicianship shows and you have superb material to choose from. Where were you all trained? Jeff: Tom studied cello since he was really young and then majored in music in college. I believe our drummer, Jeff James, also studied percussion in college. Ted took guitar and piano lessons in his youth, then went out on the road. I think John took some guitar lessons as a kid, then switched to bass and started learning on his own. I played the trombone in high school, but switched to singing after I graduated. I’ve never had lessons in voice, or guitar or keyboards. I’ve been fortunate to play with some really patient and helpful musicians who helped me progress to where I’m at. Which compared to the guys in this band, ain’t far! I think we’d all agree that any proficiency we each have has come from playing a lot over several decades. Nothing beats experience! Judith: I got all excited when you played Todd Rundgren. He was certainly one of the most talented people of the era. I have loved Todd since junior high. He was/is an incredibly gifted songwriter, singer and producer. Were you a big Todd fan? Jeff: Absolutely! I came to Todd in a round about way. Of course, I remember his radio hits in the 1970’s, but I was a huge Utopia fan in the 1980’s. I worked my way backward from Utopia to his early solo material. Then, after Utopia, I loved the stuff he put out in the late 80’s up to now. Truly a brilliant musician. Judith: Jeff, Just going with your opinion, who were the best bands of both the 1960's and the 1970's? Jeff: Best is hard to define. Simply due to the diversity and experimentation that came out of those decades. Since I was a trombone player, I was always mesmerized by Chicago. I also loved Blood, Sweat & Tears, but bands like Yes, Kansas and Genesis all helped create a new progressive music genre. Then Deep Purple, Led Zeppelin and The Who rocked out harder than most. I also loved James Brown, Sly & The Family Stone, Al Green and all the great 1970’s soul music; and how do you not put the Beatles and the Rolling Stones on the list? Clearly, I’m overwhelmed! Judith: Who was/is your go-to female singer? Jeff: There were so many great artists. Ann Wilson of Heart. Susan Tedeschi. A Canadian singer who had a short lived career named Amanda Marshall is incredible. Janis Joplin, Bonnie Raitt, and Linda Ronstadt are played pretty regularly at my house, too. Judith: Well, the obvious next question is who is your favorite male singer? Jeff: When I was seriously starting to sing, I was a huge fan of Steve Walsh of Kansas and Lou Gramm of Foreigner. Those guys had incredible power, range and emotion. My voice is nothing like theirs, but I was inspired. When I started singing in horn bands in the 80’s, I really came to appreciate blues and R&B guys like Freddie King, Wilson Pickett, and James Brown. To me, the great singers, whether they are male or female sing with soul. It doesn’t matter how many high notes you can hit, you’ve gotta make the audience feel something. It’s not easy, and that’s why the greats are great. Judith: Stung Out plays throughout the Chicago metro area. Does the band have plans for going beyond the market? Jeff: We’ll play just about anywhere! We’d love to expand our reach as much as possible, but we really aren’t planning to take over the world any time soon. We’re incredibly thankful for the loyalty of our audiences. We recently celebrated five years together and over 200 shows, so it is kind of hard to plan on much more, but maybe next year. Judith: Dream venue! If you could play any one venue in the country, which one would you choose? Jeff: Red Rocks Amphitheatre which is outside of Denver. It looks like an awesome venue! Judith: If you could have dinner with just one musician/songwriter/singer from the era who would it be? Jeff: Wow! You’re making me think! I think it would be Warren Zevon. He wrote songs with great heart, sadness, and humor and some were also pretty weird. I read his biography and it really made an impression on me. Not sure I could have kept up with him, but dinner followed by cocktails would be most intriguing. It’s sad he’s gone. Judith: The proverbial stuck on the desert island question: You are stuck on that island and you can only take five albums with you. What would you be taking? Jeff: These are off the top of my head, and I’ll probably want to change the list tomorrow, but here goes. I'll give you six instead of five! Judith: Did any one musician influence your work more than any other? Jeff: In 1980, I started as a lead singer with a bunch of local guys who are still some of my best friends. We had a trumpet, trombone and sax player in that band and one of the guys gave me a cassette of an album called Hearts Of Stone by Southside Johnny and The Asbury Jukes. A fun horn band out of New Jersey. I had no idea who they were, but I related instantly. Johnny is a gravelly voiced blues guy who sounds like he is having a party on every cut. So, I’d say Southside Johnny was really the guy who made me think I could pull off being a singer and have a great time while doing it. Thankfully, so far, so good! Judith: The rock and roll hall of fame has been notorious for making certain artists wait a long time for their induction. Is there an act that hasn't been inducted that you would like to see finally get their due? Jeff: There are several! Jethro Tull, Todd Rundgren, Warren Zevon, Bad Company, War, Harry Nilsson, The Guess Who. I don’t envy or blame the Hall Of Fame. Picking favorites is not easy, or fair. I’m sure they’ll get it right eventually! Judith: Music is such an essential element of film. Imagine films like Rocky, The Magnificent Seven, The Mission, Butch Cassidy and the Sundance Kid without their scores. The joy of watching A Hard Day's Night! In your opinion, what is the best music film of all-time? Jeff: It's still hard to top Woodstock, even after all these years. It's so iconic with incredible performances. Same with The Song Remains the Same. Great bands captured at their peak. I gotta mention The Blues Brothers. It was pretty inspirational. I also liked a documentary called Muscle Shoals about the music and musicians who worked in that historic studio and another about a legendary producer called Tom Dowd and the Language of Music. I'm a classics kinda guy! Judith: Since you spent much of your career in media, television and editing, what do you feel is the best use of music in a current television series? Jeff: I loved the music in Breaking Bad. In that same vein, music is great in Better Call Saul. My other favorite would probably be Fargo. It's an odd and quirky show and the music they use is great. Eclectic and mood making. I'd love to have a job picking music for television. Beatrix is one of the most delightfully hip, energetic and downright happy-go-lucky eateries in the entire Chicago metro area. This is one of the key locations you run to for absolutely creative and delicious food. Dare one say it, but why not say it, we love Beatrix. Whether you are ordering appetizers (don't miss the wildly fabulous potato salad deviled eggs), breakfast (egg sandwiches rarely come better), brunch, lunch, dinner or dessert (blueberry pie slab!) you will not be disappointed. Mushroom and quinoa burgers match the taste of the superb beef burgers. The salads are inventive and daringly good. Go with the Straight A salad (it is a straight A) and one of the finest kale salads being assembled in the city's center. You can't miss out on the Kennebec fries. They are salty, but ever so good. Beatrix is consistently beyond excellent. The service is attentive, helpful and the servers are highly knowledgeable. This is a great place for a group outing or a one-on-one conversation. The acoustics are loud, but you can hear your seating mates. Excellent options for the vegetarian, although not quite as vegan friendly, but they will make to order items based on your dietary needs. 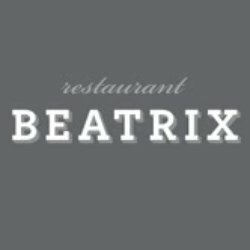 Beatrix is a Lettuce Entertain You owned location, so pull out those gift cards you undoubtedly must have received for some life event and make sure you make reservations at the lively, dependable and outstanding restaurant. Don Henley is not only one of the most gifted songwriters and singers of the rock era, but he is also one of the most underrated members of that same era. He is a lyrical poet who writes about life, as it is. His current album, Cass County is packed with one magnificent song after another, which is a rare feat for any artist, but certainly an oddity for a 68 year old. Cass County is the first album in Henley’s career recorded under the Capitol Records label. It is a success story for an industry that has a difficult time launching anything outside of certain contemporary artists. Henley paid tribute to Capitol Records by acknowledging that this was the label that gave us Frank Sinatra (a third of his career), the Beatles, Nat King Cole and the Beach Boys. The tour opened a couple of weeks ago and it is a short one, so unlike the iconic band he is a founding member of he will not be on the road for years or even months in support of Cass County. The show last night opened with Seven Bridges Road, the only piece of music ever performed by the Eagles that Henley brings forth during this show. The tremendous vocal group assembled of his current touring band were outstanding as they brought forth delicious harmonies at the Chicago Theater. Henley has enough material to do a full-course show without reverting to the giant hits of the band. 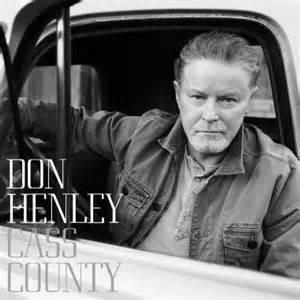 Henley supplied nearly the entire Cass County album and each song worked. It was like listening to songs you already knew, but that is in large part due to Henley’s still vibrant and silky voice; and his innate talent for bringing to life images and moments from life. Clearly, the aged Henley doesn’t match his once perfect vocal style and skill, but there is still a mighty giant lying in those vocal chords. He waxed poetically in a raspy voice a couple of times, but the raspy worked. That raspy voice sounded lived in and it was at times heartbreaking and haunting. He pulled a variety of songs from his illustrious solo career, including one of the finest songs ever recorded by anyone, Dirty Laundry. As Henley put it “it is still relevant” and “now it’s even worse.” Yep, the bubble-headed bleach blond comes on at five. The opening strands of Boys of Summer still excites to the core and there couldn’t be a more beautifully written ode to love and lost love than The Heart of the Matter. This stunner appears on his album, The End of the Innocence and from my perspective it is the best song of his lengthy songwriting career and yes, that is saying something. The show was a shocking two hours and forty minutes, which was an unbelievable tribute to fans, particularly since he didn’t have to do it. Fans would have been thrilled with two hours, but Don gave us what we wanted and we didn’t even know we wanted all of it. He pulled out a cover of Everybody Wants to Rule the World from I don’t know where, but wow, it was a highlight of the show. All She Wants To Do Is Dance literally had everyone on their feet. The musicians assembled are some of the nation’s finest and it was a tight fit all night long. Unlike some other artists, Don Henley played it straight and delivered the tracks as we know and love them. The three female backing singers (at times, they sang duets with Don) were all terrific and easily could have been headlining their own shows in another era where talent once won out. Henley did more speaking on stage than he has done in his entire career. He spins and weaves stories for almost every song. Some are longer than others, but you didn’t want him to stop. The story he delivers regarding Train in the Distance was touching, heartfelt and sentimental. He may be the most down-to-earth and steeped in reality famous person in the world. You literally want to have lunch with the guy. He’s smart, well-read, insightful, a gifted storyteller and downright funny. I laughed out loud several times as he managed to be funnier than most comics on late-night programs. He delivered stories about rain in the southwest, making plenty of mistakes and he delved into a revealing situation when an old flame wants to reconnect. Not for the romance, but just to stay in touch. The show opens with a lovely montage of audio bites filled with famous speeches (think Franklin Roosevelt after Pearl Harbor and John F. Kennedy asking what can we do for our country). The audio clearly showcases some of Henley’s favorite music and we hear everything from the Glenn Miller Orchestra to Elvis Presley to Patsy Cline to the Beatles. Above the stage are a collection of vintage radios that embody Henley’s life in music. It's a simple tool, but a creative one. I will look forward to his next go-round. One of my deep emotional attachments from a musical perspective is the music of the Eagles; and Henley was clearly one of the main reasons why their music and his music still resonate so powerfully in my own personal life. Chicago has been gifted with a wide assortment of spectacular museums. Visitors from inside and outside of Chicago's borders can choose from a variety of different locations, including the Museum of Science and Industry, the Field Museum, the Art Institute, Shedd Aquarium, Planetarium and a large number of smaller museums that cover everything from nature to various ethnicities. The largest Holocaust Museum in the nation is in Washington, D.C., but Skokie's Illinois Holocaust Museum and Education Center is an outstanding museum that serves to educate, restore and memorialize the millions of people who were catastrophically destroyed by evil hatred. The museum offers solid information on the overall historic journey that dates back to the end of World War I; and takes the visitor through a thorough and near all-encompassing history from that period through the end of the Second World War. Since it is a Chicago based museum there are multiple examples of Holocaust survivor stories from this area, including five detailed stories of marriage, family and love that survived. Discussing and studying the Holocaust is never an easy situation due to its graphic background and brutal nature, but this is history and even though multitudes have said "never again" we are now witnessing the rise of not one, but several terrorist groups taking down Jews, Christians and fellow Muslims just because of what they do or don't believe. The museum ends with a lovely room of remembrance and a hall for thought. It's a physically beautiful location with stunning features reaching around every turn of a corner. One of the items in the museum is an actual train car once used to carry our fellow human beings to the gas chamber prison camps.Standing in it made me feel below human. I can't even bear to see cattle in a train car, so the imagining of a human being in one is a near devastating experience even with the weight of seventy years plus. This museum is highly recommended, so set your calendars for a destination at some point this year. There are some graphic film clips and images, but schoolchildren 12 years and up would be able to learn from the history. White hair. White beard. It's December. I just described what one of the most successful and yet undervalued rock stars of all-time currently looks like, but even at 69 years of age his wonderfully spirited on-stage style has not been dampened by the years of time. Seger is still the fist pumping, foot stomping roots rock & roller he has been since his first run on vinyl some 45 years ago. 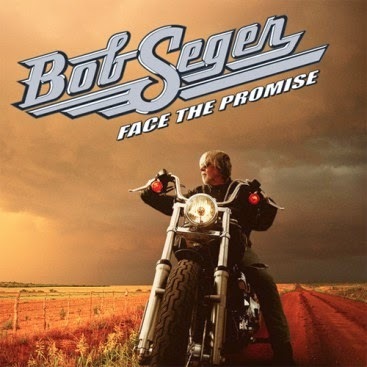 Bob Seger is one of the most definitive acts of the classic rock era. He is American to the core and he is rock & roll at its purest and finest. His unpretentious and non-elitist brand of rock sets the tone for the time capsule of that now bygone era. When people say rock & roll is dead they are stating truth. We will most likely never hear original music on this level ever again. Occasionally an act may come out of nowhere to loose the overhang of the roots of rock, but as an en masse brand it is over. Which is why in many ways this music is still so beloved, cherished and even adored. I personally know several "young" people who love Bruce Springsteen, Fleetwood Mac, Journey, the Eagles, Led Zeppelin and of course the big kahuna of them all, the Beatles. Seger is a master craftsman and a superb artist both vocally and stylistically. His compositions of thoughtful storytelling weaving us through the landmarks of life (love, romance, work and the American heartland) continue to tug at the soul. Last night in front of a sold-out crowd at Chicago's United Center he delivered the goods. His brand of music is clearly the most trusted root of rock with a nip of country and a nip of blues depending on which classic Seger song you have plugged into. He even manages to deliver some of the subtlest of ballads. When he sits down at the piano to intro one of the most beautiful ballads of the last 40 years he shares that this particular song was his mom's favorite composition of his. I kind of knew where we were going and the opening notes served a hauntingly stunning We've Got Tonight. Get emotional time. He opened the evening with the explosive Roll Me Away. The descriptive of America as a geographical destination as well as a concept is all over those lyrics and music. His sit-down guitar time on the title track of his only number one album, Against the Wind had the mid-30s' guy sitting next to us crying. He eventually shared with us that this was his dad's favorite Seger song. The guy's father passed away two years ago, but he shared Seger's music with his dad. Clearly, this was an emotional night for many in the UC house. Seger's blue collar, non-political, non-angst ridden brilliance covered the masses last night while we all punched the air and stomped our feet to songs that have so much meaning. The poetic Turn the Page was executed superbly and it never fails to get me to sing along (along with everyone else in the venue). No one needed a prompter or big screen with lyrics. The words are embedded on our minds, hearts and lips. Main Street takes us down a sentimental path and Travelin' Man makes you want to stand erect and go on a road trip. He of course, has to give the funders (a reasonably priced show) of the evening Old Time Rock & Roll. It was named as a song of the 20th century. Yes, he owes this one more to Tom Cruise than to his own spirited interpretation of his own song. I anticipated the surety of a few moments of happiness and with Beautiful Loser I got my wish early on during the near two hour performance. Shy of two hours by only five minutes. Unlike many of his contemporaries, Seger still sounds great. If you had closed your eyes you never would have guessed it was 2014 and "Bobby" (his mom called him Bobby) was pushing 70. I felt like I felt the night I saw him back when Night Moves was still charting on the Billboard 100. He didn't perform several songs I love. He didn't perform You'll Accompany Me, Shakedown, Betty Lou's Gettin' Out Tonight, Long Twin Silver Line (literally one of the greatest rock songs of all-time!) or Feel Like a Number (Mickey Rourke deserves credit for the early 80's resurrection of that classic). Seger could have been on the stage for another hour (why not?) if he played all of the songs we all still know and love. His band (three members have been with him for a long time - Alto Reed, Chris Campbell, Craig Frost) is as tight as a pair of skinny jeans after a Thanksgiving meal and the lead guitarist (Seger's material is very lead guitar driven) is so good you find yourself paying attention to him as much as to Seger. Backing singers are talented and add to Seger's lyrical content more than the average singers on a stage with a lead act. The J. Geils Band is the opening act and Peter Wolf still has enough manic energy to deliver a 45 minute set. Seger is a must on a bucket list, so take advantage of this tour. I suspect his bucket list may include Detroit, Florida and football, even though he has a new album out and the songs (he performed several new songs) on it are all worthy of his formidable catalog. I have been fortunate to see some of the giants in the last year and I say this all the time. Go and see these artists while you still are able and while they are still able. People are getting older and our days to enjoy these people who have brought so much to our lives will end one day. If for some reason I live to be 90 I will treasure my God, family, true friends and the music. "I reminisce about the days of old with that old time rock & roll." The U.S./Canada tour continues through March 7, 2015. Let's start with the undeniable. As they push the 70 year old mark or pass the 70 year old mark (depending on which member you are referencing), Fleetwood Mac doesn't need a disclaimer. They don't need asterisks. They are still an engaging and gifted group of songwriters and musicians and; of course they are one of the greatest rock bands of all-time. No embellishment attached to that statement. The five of them haven't performed together since their 20 year Rumours reunion tour back in 1997/1998. Those were engine cracking performances and somehow even after nearly 20 years since those shows the Mac clearly is back at least for one more go-round of live performances. New material is being suggested, so if they are all still alive and healthy we may see them on the road again in 2016. Fleetwood Mac was blessed with not one or even two gifted songwriters - they had the winning lotto ticket of having three enormously talented composers/lyricists. I love Stevie Nicks, Lindsey Buckingham and Christine McVie's often powerful pieces of prose set to complex music beds. Having seen Fleetwood Mac perform twice on tour in the last 15 years without McVie, it is delightful to have her back. She balances out the band with her illustrious ballads and pure form of mindful pop. Her voice is near perfection. If you didn't know it, you wouldn't notice much of a difference from her mid-1970's voice. Nicks has been the biggest star of the band ever since their heyday, but what has always made her special is her love of the group dynamic and her willingness and wisdom to not to want to be the only one on the stage. She's always totally present on-stage and her ability to rock out is still stunning. No woman ever did rock quite like Stevie Nicks. Her Landslide and Silver Springs are gorgeous, timeless and among the best songs ever recorded. Her Gold Dust Woman holds tightly as one of the finest rock vocals of all-time and she does that track justice 37 years later. She even delivers a bit of twirling on Gypsy. Buckingham is one of the foremost guitarists of the last 60 years and he astounds with his artistry. He's the eccentric one on stage and it works. Kicks and grunts and all. Big Love is a mighty tribute to something long gone, but with his gift for showmanship he brings all the emotions back to life - right on stage. Who else could possibly have turned Tusk into a hit song? It still sounds unique! They play through 24 songs, all of which are highly recognizable (I counted only five notable hits which weren't performed). Their catalog is deep, rich and diverse. With three singer-songwriters that is inevitable. It's an exact two and a half hour show. Every single second is worthwhile. Mick Fleetwood and John McVie hold court on drums and bass and clearly add to their all around glorious gifts of music to the masses. In the 1974 film, That's Entertainment, Frank Sinatra proclaims "we will never see the likes of this again" (referring to the golden age of movie musicals). 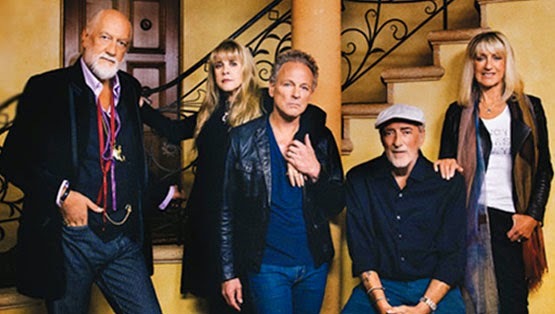 Clearly, anyone witnessing last night's spectacular performance by Fleetwood Mac at the United Center could utter those same words about the classic acts of music that began their careers during the classic rock era. No wonder why the place was packed with middle-agers and young people in their 20's. People looking for significant rock/pop music look no further than the five people who are Fleetwood Mac. The On With the Show tour just started this week, so the country and the world have plenty of time to grab tickets and go. Don't miss the legends. Memories last. The End was the last song on the last album recorded by the Beatles. It is the best album of their storied career. Athletes don't end on quite the same note that many pop/rock stars end on. The Beatles gave up on each other while their members were still all in their 20's. Sad for all of us. Athletes end their careers as their talents, skills and abilities are on the wane. Paul Konerko, a veteran of 18 seasons in major league baseball and a sixteen season veteran of the Chicago White Sox will end his career on Sunday, September 28th, 2014. One could argue Konerko easily could have walked away from the game at the end of the 2013 season, but I will not argue that way. His sixteen years with the Chicago White Sox ties him for the fifth-longest tenure in franchise history. He is second in home runs and RBIs only behind the legendary Hall-of-Famer, Frank Thomas. He is a six-time All Star. As captain he led the White Sox to their first World Series Championship in 2005 after fans waited for 88 years. I write this as a fan. A fan of baseball. A fan of the Chicago White Sox. It is in my DNA. Well, not literally, but figuratively. My father was born and raised four blocks from Comiskey Park. My mother loves her boys. I shared the greatest moment of Paul Konerko's career with my mom. It was Sunday, October 23, 2005. I was at the first two games of the World Series at U.S. Cellular Field. More importantly, I flew in from Los Angeles where I was living at the time to watch the first two games with family members. Even more importantly, I was with my mother at game two. It was pouring through most of game two, but for the first time in my life it not only didn't matter, I didn't seem to even notice. We had our hoods up on our winter coats and we settled in. Me and my then 82 year old mom watching the Chicago White Sox in the World Series. My mom is now 91 and she rarely misses a White Sox game, although she is now unable to attend those games in person, so dare I say thank God for Comcast SportsNet, the U and WGN. The Chicago White Sox were my family's team. Historically, we go way back. No one alive in 2005 that I knew was around when they won the World Series in 1917, but here we were. Our team had a remarkable season and they were now up one game and into the second. Paul Konerko who had endeared himself to White Sox fans at that point was up to bat and there it was - a Grand Slam home run to put the Sox ahead in game two. If we could win game two in Chicago we would head to Houston 2-0. The White Sox did win game two as they headed to Houston and they won the World Series in 2005 in a sweep. Houston never saw it coming, but the devoted fans did. The last two games of his career will take place on Saturday, September 27th and Sunday, September 28th. That's it. I will be at both games. There is consequential artistry in the beginning of a significant career, but there is an even greater art to closing out a career. Konerko, by all accounts has handled himself with grace, integrity, humility, loyalty and dignity in his 18 season career in professional sports. He was a very good player. An exceptionally good player, but seemingly an even better teammate. That is a job well done. By all accounts, he is a nice guy with a wife and three young children. He will go to Arizona and try to find something else to do with the balance of his life. After all, he is only 38 years old. Young by almost any standard other than sports. He's got the Gibson Les Paul guitar gift from the Cleveland Indians. Maybe. No, it's too late for that career. Paul Konerko will be missed. I bought season tickets this year for the very reason that it was Konerko's last season. I will cry. I will stand up with respect. I will wave farewell. I will be in Section 159 on the tribute night looking at the blue seat - which represents where that World Series Grand Slam landed (the last one hit in a world series). "When you're on the field for the last out of a World Series, on the winning side, there's nothing really even close," Konerko said. "I don't think I've had that type of a feeling before or since." Paulie!!!! #14 will live long in my heart and in the hearts of many other fans for many years to come. I will take the World Series Champions of 2005 with me to my own grave. I didn't do a thing that season other than relish their victory with every family member that ever lived, walked and breathed. My eldest brother passed from a terminal cancer four years before that now iconic season. He missed it. My dad died from complications due to Alzheimer's three months before the final out in Houston. He missed it. I was back in Los Angeles watching the final two games alone in front of my television. My family had been in their homes in the Chicagoland area. I opted not to go to Houston even though my friends at ESPN said they'd get me tix. For some reason I felt I wanted to be alone. I cried that night. Tears of joy. Thank you Paul Konerko for your loyalty and your long tenure. May you return as a coach at some point when you feel it is the right time. You will be missed. Only Luke Appling played in more White Sox games in his career. No one played more under the radar than Paul Konerko. He was always underappreciated, but no fan base identifies and connects better to a player. I loved the way he would make an adjustment in the middle of an at-bat. I didn't even know what that was until about six years ago and then I started paying attention to it. He was one of the most honorable players ever to set foot on a field. Strong work ethic. Humility. Loyalty. No pretense. Cared about his teammates and his city. Leader. Length of years. Charitable contributions. Teammate. Mentor. There is something poetic about Konerko. Just something. If he has one more home run left in him (439 is his total) the last two games would be a good showcase to get to 440. This is the official Chicago White Sox farewell video. I cried. "The Lord bless thee, and keep thee; The Lord make His face shine upon thee, and be gracious unto thee: The Lord lift up His countenance upon thee and give thee peace."